Simply overshadowed by the presence of Reggie White on the other end, Clyde Simmons was a dominant end from Buddy Ryan’s criminally overpowered defensive line. 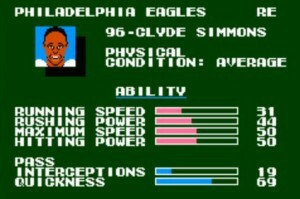 After going to tiny Western Carolina, Clyde Simmons was drafted in the 9th round of the 1986 draft by the Philadelphia Eagles. The 86 draft is notable because it provided a lot of depth across the board- both defensively and offensively to many teams. It wasn’t an overpowering draft in terms of ProBowl and HoF talent, but it certainly yielded many recognizable names. At 6’5″, 292, Simmons had some great measurables coming out of college and was definitely a sleeper pick, going behind such names as Tim Harris, Charles Haley, and fellow teammate Seth Joyner. 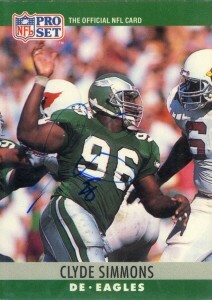 After a quiet rookie season, Simmons began to ramp up his statistics and by 1989, making 15.5 sacks from the other end. He’d follow this up with 13 sacks in 1991 and a career high 19 in 1992. In both 1991 and 1992 Simmons was named to the All-Pro team and the Pro Bowl for his contributions. Cut after training camp in 1994, Simmons signed with the Arizona Cardinals. After adjusting for a season, Simmons would again reemerge as a threat notching 11 sacks in 1995. He’d sign with the Jaguars in 1996 playing with them for two seasons making 16 sacks, before one season with the Bengals in 1998, and 2 more seasons with the Bears, retiring after the 2000 season. Well balanced- Simmons during his time was an imposing force against the run finishing with over 100 tackles 3 times in his career. Simmons is not well remembered by fans typically outside of Philadelphia. Overshadowed by Reggie White and more boisterous members of the Eagles defense, Clyde quietly amassed 121.5 sacks over his career and in 13 straight seasons never failed to make at least 5 sacks. He’d make over 10 4 times in his career and finished 3 off from the single season NFL record in 1992. Simmons has been doing a lot of different things since retirement in 2000. Moving to Georgia, he worked for a mortgage company, and was a probation officer but after watching his son play football, was disgusted by the bad fundamentals players were utilizing. Clyde decided to join the NFL’s minority coaching fellowship and was a defensive line coach for the New York Jets in 2010.